I really, really like this new KwikSew knit top. 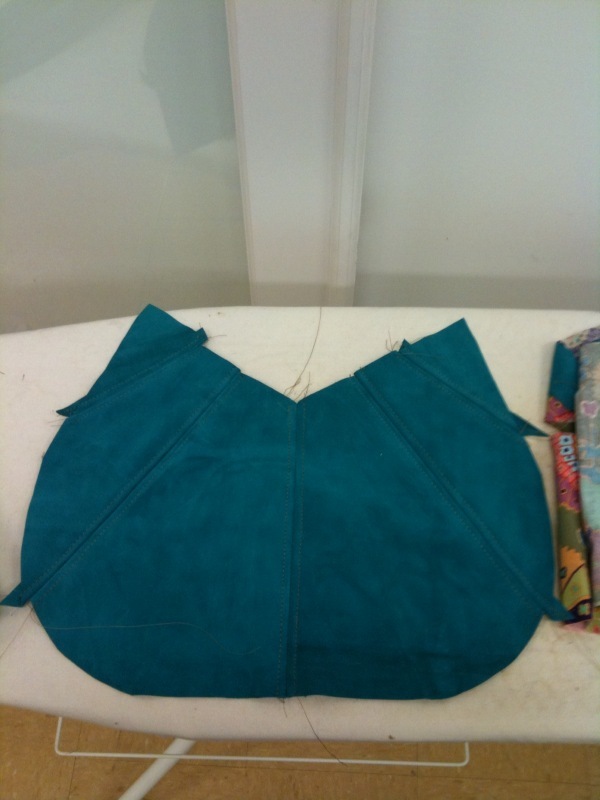 It's got side gathers on one half and a fun asymmetrical shoulder. It's KS 3790. This may be a splurge for me once this summer hits and I have more time. I love the cap sleeve version. I finally finished this Burda coat. It's actually been done for quite a while but I wasn't around this computer so I couldn't post pics. I always have my iPhone but I find the picture quality isn't great and the formatting is always really bad. I really like it. I do not like this particular belt. I think I need something "harder" if you get my meaning. This belt is too flowy, loose, and just all wrong for this coat. I sort of feel like a lumberjack in his bathrobe sometimes but overall, I love it. I really, really, love the snaps. It took for-EVER to sew them on but it was totally worth it. I need a haircut. I did the belt loops on the bias and lined them up with the stripes in the plaid. I really like how they turned out. Dang! I know I have a photo of the back but where did it go??!!? Here are the fun snaps. They are big. I used Gutterman upholstery thread to sew them on. Here's a close-up of the snaps. My handsewing has gotten so much better in the last year. Next up? Another Jalie cardigan. It's all cut out and ready to go! Okay, I'll be posting regularly again for two weeks. I'll actually start participating in the Jeans Sew Along too (gasp!). Look at this great fabric my friends gave me. This fabric is from Paulette. The blue/purple on top is a beautiful cotton woven. It's a very loose weave. I should have asked her what kind of weave it was but it's super cool and airy. The purple/black/green is a cotton knit from her stash. I was ogling it and she made me take it! Damn that woman! I think I'm going to try to squeeze out a knit dress. Maybe another Burda wrap dress? I wear that thing all the time. 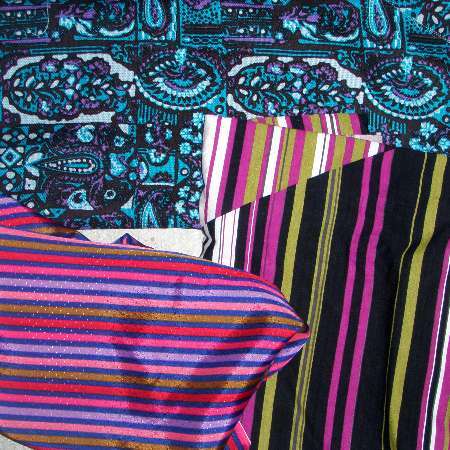 The bottom left (blue/purple/pink) is a polyester (right, Paulette??) 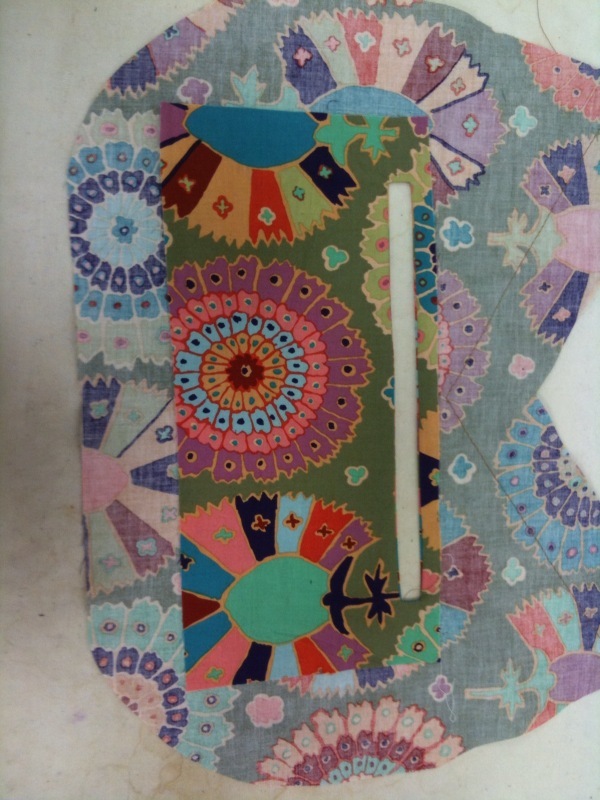 lining fabric. I'll be using it for a lining on something too. It's just way too fun to hide under a skirt so it'll be a jacket lining or something. Then Karen sent me this fan-freaking-tastic silk duppioni from her stash with matching vintage buttons!!! It's totally my colors with the burgundy, red, rust, and lavender. I love, love, love it. I may make it into a shirt dress like Karen suggested. 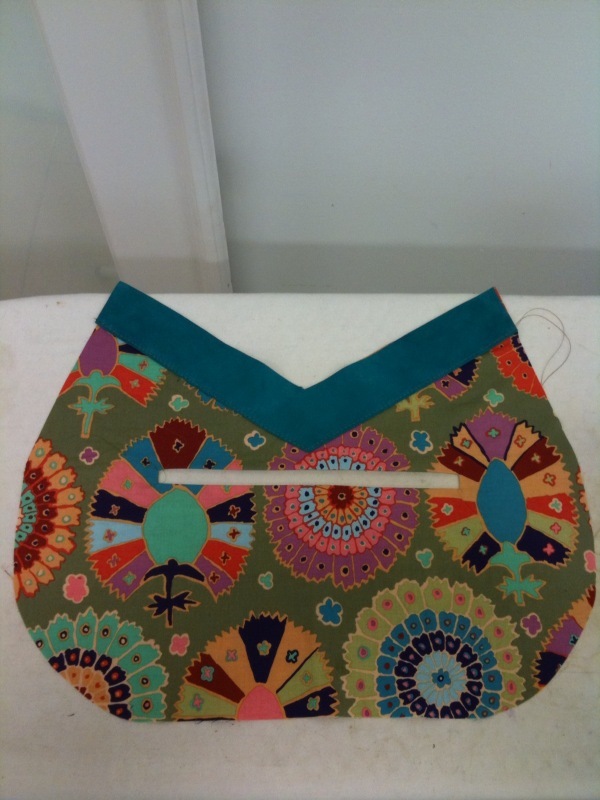 Wouldn't a bias placket be fun running down the front?? Thanks guys! 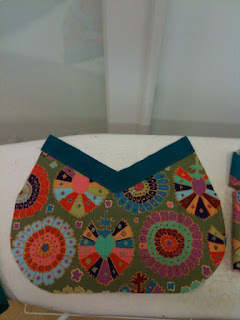 For the next two weeks, I'll be sewing and posting away! I've been wanting to make a purse for a while. 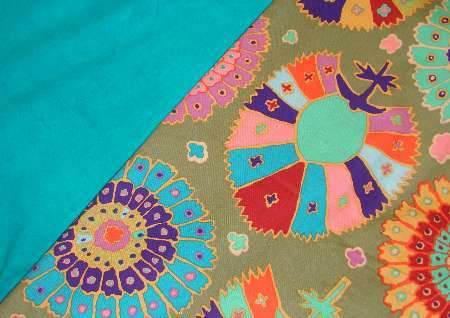 The torquoise on the left is suede (HOW FUN IS THAT COLOR??). The fabric on the right is a quilting cotton for a lining. I think I'll use the Gutterman upholstery thread for topstitching. I like the light tan one on the bottom. 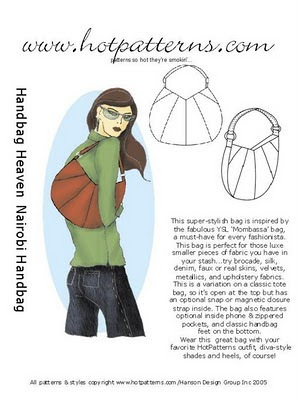 I'm going to make this HotPatterns bag. I'm hoping I can cut it out and make it this coming Saturday. We'll see how fast I can work my way through it. I'll be using one of Paulette's machines at Seams Like Home. 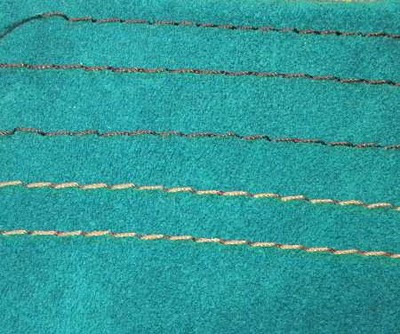 I think this will come up right away so I'm going to tell people what I suggest for topstitching thread. Every person prefers something different and some machines like different brands, thicknesses, needles, etc. 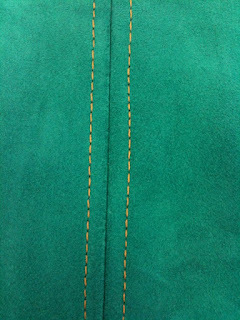 For jeans topstitching, I either use Coats and Clark Heavy Duty thread. I have it in the following colors. 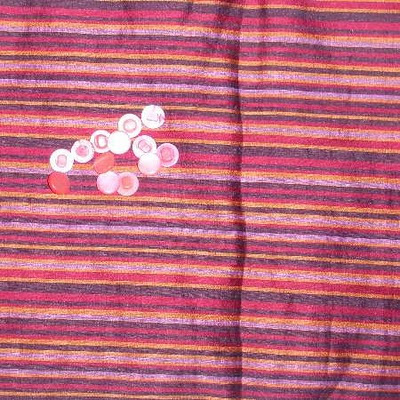 I have used the middle two colors for jeans. I used the yellow color for this BWOF flared skirt. The other thread I use quite a bit is this Gutterman upholstery thread. It's thicker and a bit shinier than the Coats and Clark. There isn't a huge range of colors but I do love the muted shades I have bought. I used the white thread on my black jeans. I used the grey on this vest and the brown on this coat. This time, I'm going to use this honey brown color for topstitching. I always make sure I have a matching regular-weight thread for my embroidery. I don't want to put upholstery thread through my embroidery machine but usually do want to make the color on the pockets match. The thread on the right is just regular Coats and Clark Dual Duty thread. For needles I usually use a Jeans needle in 100. I like to use my ancient Necchi which goes through layers of denim like butter. I also have a Viking Madison but it does not like thick thread or multiple layers of denim. Here's my first La Mia Boutique pattern. I made this top after seeing Melissa's version. I graded down to a size 36 for this top. My waist and hip measurements fall squarely in the size 40 category but I am using a veeeerrrrry stretch cotton/bamboo knit. Melissa said she wished she had gone down a size because it was roomy. I changed the sleeves as I didn't have enough for the full length. I added cuffs to the ends of my short sleeves. Obviously it's pretty windy today. Oh and it's not hemmed yet. I have one more knit thing to make before I change my serger over to a coverstitcher. There's the swayback. On knit tops like this, I don't adjust the pattern for my swayback. I could take in the sides a bit around the waist because of the streeeeetch of this knit. Here's a normal shot so you can see the gathers and cuffs. Melissa had a problem with the gathers sticking out at a weird angle. I didn't have that problem but my knit is super-duper-schluper drapey so I don't think it would happen with this knit under any circumstances. She also noted that the sleeves caps were a bit high. I should have shaded down the top of the sleeve like she did. I found that I had to stretch the armholes so much to set in the sleeves that I have some bumpies on the top of my shoulders. You can kind of see it in this picture. Next up? A coordinating Jalie cardigan to match! The jacket is almost done. I'm saving the snap sewing for TV watching time. I have 6/10 parts in the coat. I haven't found a belt I like but I'm still looking. I plan on cranking out a few more pairs of the Jalie jeans. They fit me fantastically and I don't need to do any fit modifications at all. I may change the straight waistband into a countoured band but, then again, I might not. We really need to help each other find suitable denim. I ordered this yardage from Fabric.com a while ago and did a little comparison for you here. Hope to see you on the PatternReview thread!!! sewn on. But I'm pretty sure they are going to rock. I guess I'm back. 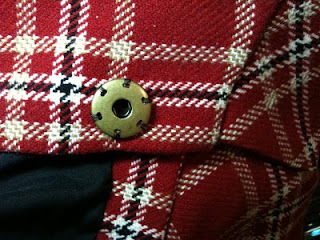 I was able to accomplish a LOT on my coat today. In fact, it's all sewn up except for a belt, belt loops, snaps, and the inside seam where it needs a bit of hand sewing. There is one problem. I don't have enough to make a belt out of the same material. This is a purple wool belt from this other Burda coat. I am thinking that I may try to find some black leather and make a black leather tie belt. What do you think? I'm not sure if it will look too thrown together. Maybe with some nice plaid belt loops it won't look too bad. Maybe I can make them thick and do four of them or something. I'm not sure . . . Overall? Well, I love it, of course. 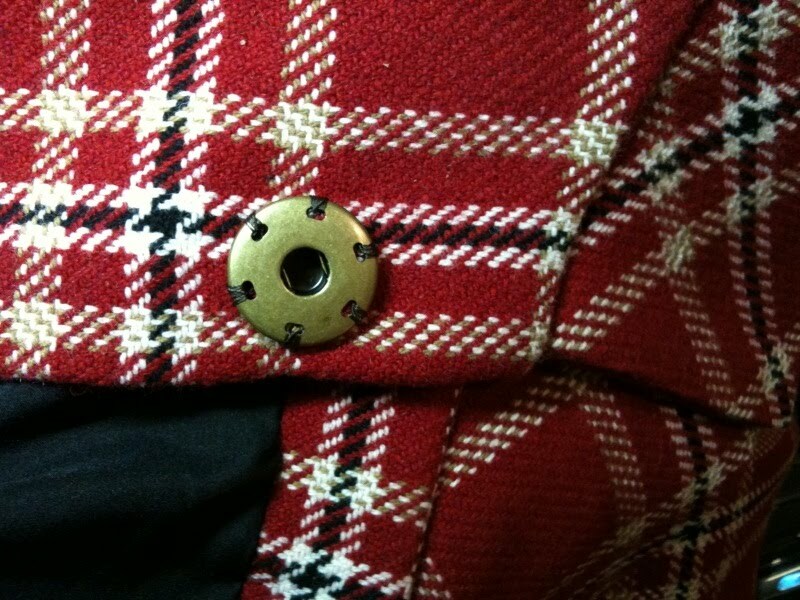 Nothing screams Dawn like RED, PLAID, and BRIGHT! I fixed the Luke Skywalker sleeves. I love how the plais lines all come together in the back. I put the collar on the bias because, well, why the hell not? I think I'm going to use these big sew-on snaps. They are fun and I've always wanted to use them in something. My iPhone is there for reference. These puppies are big-uns. 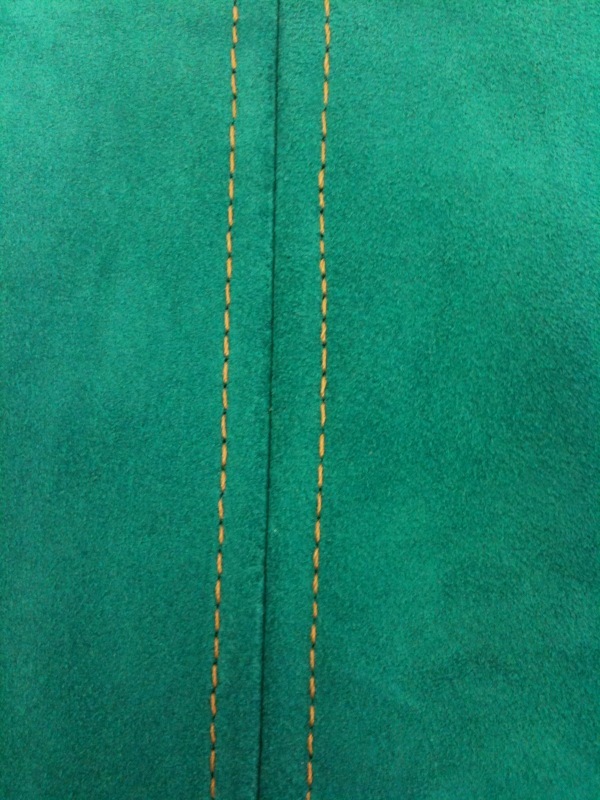 Here's the intersection of the facing, lining, and hem. Usually I can never get this area to look decent. I used this Thread's tutorial this time. It seems to work really well and it doesn't look bad. I've tried the Fashion-Incubator tutorial for bagging a jacket and it never works for me. This is another Gorgeous Fabrics fabric. I was planning on doing an Ann fabric every week while she was doing her hospital visits but then the bottom of my life fell out. I was still thinking of you Ann!